It's that time of year. The sugar maples are giving up their sap that will be turned into the number one pancake topping maple syrup. Taking a drive last week we came upon many of those familiar buckets, hanging in front yards and along roadsides. Many people just make enough for their use and others have huge commercial operations. At our house we go through a couple of quarts yearly, not only for pancakes but also for cooking. Baked beans, chili, stews and in various baked goods. Oatmeal's best friend is maple syrup. Local is best, but imports will do quite nicely. Get away from supermarket maple flavor stuff. I checked out a few new blue lines. They look promising but will not know for sure until I fish them, which will be soon. The east branch of the Eight Mile river is free flowing. The dam at Ed Bill's pond has been removed and restored. The dam removal opens up the river to new spawning grounds to many fish species including trout. While reading through Dave Hughes book Wet Flies I came across a couple of patterns that I thought I'd share with you. The patterns are listed but don't seem to give credit as to the origins of the flies. The first one is a Purple and Starling...simple thread body with a few turns of Starling. In this photo you can see what it looks like as it would be moving through water. All those hackles moving very seductively as a living insect. The "Little Olive Flymph"...this fly represents many varieties of olive colored body mayflies. I think it makes for a nice emerger. Tied with a sparse hackle, the fly will have the necessary movement to get a trout to take. A "March Brown" flymph. There are many variants of this old pattern. 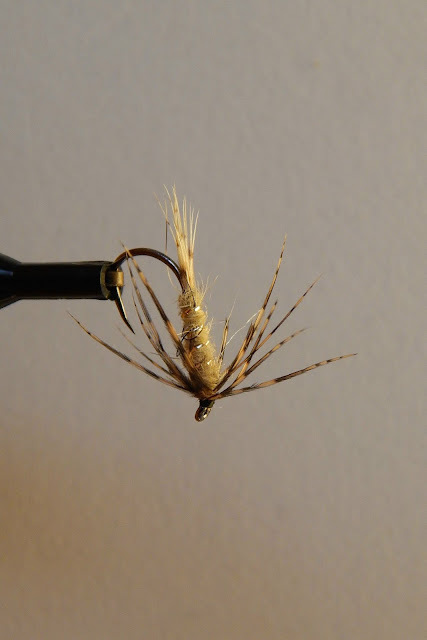 This one uses hackle from the back of a partridge. The March Brown, and the Little Olive Flymph will be fished in the riffled sections of the small streams I fish. The Purple and Starling will see use in those special pools on the Farmington. Yesterday I took a hike up a stream I had fished before. I was determined to follow it up as far as I could and fish new areas I had never tossed a fly upon, sort of like virgin water. What I found was a brook trout stronghold, a stream that was as pristine as any I have ever fished. A forest setting that was full of hemlock and hardwood, springs and laurel, and wildlife that had me a bit on edge. I'm going to take you with me. Deep pools with undercuts were in abundance. There were riffles that held brook trout this day. There were areas of laurel so thick that I said "you have to be crazy to go through it" but I did. There was a price to be paid for it though. That price was a very sore back..a muscle pull like no other I've ever had. Rewards "oh yes" brook trout with attitudes. While walking I found another stream coming into the one I was fishing. I did not explore this one, perhaps for another time. It was right around here that I encountered a three canine companions. I was fishing a run and really focused. I looked to my back, having the feeling someone was watching me and there were three coyotes. They were close but they did not look to be aggressive. We sort of eyed each other for a few moments and they just walked off. I continued to walk and fish, picking up some beautiful brookies. Not much used, or needed....keeping it simple. One of the wonderful highlights of this outing was my catching many of the brookies on dry flies, and the "Bomber" was tops. What I found out today was the brookies that took the Bomber were all taken in the riffles. Not one fish rose in the pools. To say this was a good day would be an understatement. Days like this are good in June but are truly spectacular in February. This weekend was a full one for me. Saturday morning Jeanette and I started out for the Cape which was originally not part of the package, but as it turned out it was a highlight. We stopped for breakfast at Leo's restaurant in Buzzards Bay. There we enjoyed an awesome breakfast. Jeanette had a grilled blueberry muffin, which by the way Leo's is one of the best muffins in New England. And kudos the waitress who's service was great. My coffee cup was never more than half empty when more hot black java refilled it. I had plain old eggs over light with toast....but a muffin was taken home and that's my breakfast this morning. After breakfast we headed over to Red Brook to see if I could get a brook trout to cooperate. The morning was cloudy with that constant sea breeze, which made casting a streamer with a 3wt a bit tough. Well I tried and after an hour of work in which all I had to show for it was a stiff strike and a fiber or two of bucktail missing from the Mickey Finn. Times are changing. These wind turbines were not here when we fished Red Brook in early November. I though the scene was kind of cool. The wind turbines over cranberry bogs, with a scant covering of snow. Then it was on to Taunton and the annual "Bears Den" fly fishing show. It was held at Bears Den which is a giant fly shop. They have one hell of shop, if you can't find it here you probably can't find it anywhere. I ran into many people I know including two gents from Connecticut Fly Fishermen's Association, folks from the Sea-Run Brook Trout Coalition, and was given some great information on salters that I did not know. I had the pleasure of talking to some wonderful fly tyers. One highlight of the day was spending time talking to and watching this young man tie flies. His name is Jade and he's 11 years old. He told me he has been tying flies for 4 years, and watching him work was a pleasure. It is so gratifying to see youth taking an interest in fly fishing....we need more of that. I had some Christmas money to burn so I was able to find some quality materials. This hen patch has a wonderful blue-gray color. Almost perfect feathers and it contained some fine marabou feathers which will make for some interesting action. This bleached Starling, I believe it is ginger will make some fine soft-hackles. 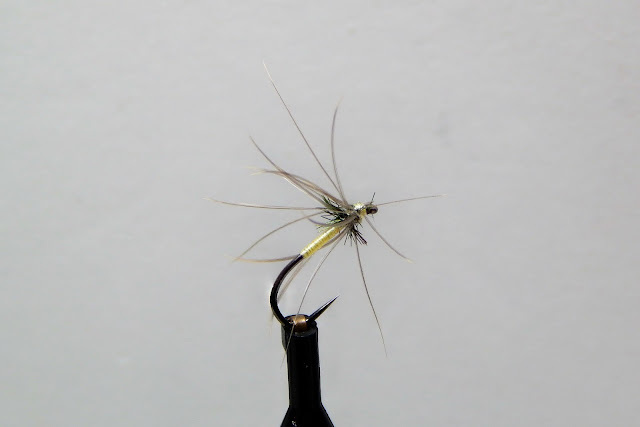 Partridge Classic Spider hooks. These have been on my list for some time. Many who follow this blog have suggested these hooks for tying North Country Spiders. That was the day, day one of a great weekend....day two will come in the next post. When you talk winter fishing you talk about ups and downs. Weather is the big downer even when it's almost picture perfect, and the actual catching of fish can be a downer if you let it. Yesterday was one of those days. I met Kirk at 9am and we were going to fish a stream we had fished before and knew it had a reputation of giving up some beautiful brookies. The stream had a tributary far upstream that was unknown to us until the day before when Jeanette and I took a hike and found it. Seeing it just said "I've got to fish that", and Kirk and I did that yesterday. We've had some weather changes in the last days from sub-zero to 50 to heavy rain to strong ice flows to back to cold, all this leads to is turned off fish. We fished all the way up to the feeder brook without a bump. I fished several wet flies and streamers and I'm sure Kirk dug into the fly box many times. It was at this point, a run just down from this scenic bridge that my fly stuck a small brook trout. The fish was on briefly and said goodbye as I lifted him. That was the day folks. Great day weather wise clear, sunny but cold. We fished a stream that could be a real keeper once Spring comes and we can determine what it actually holds. A wild brook trout stream I fish in Connecticut. 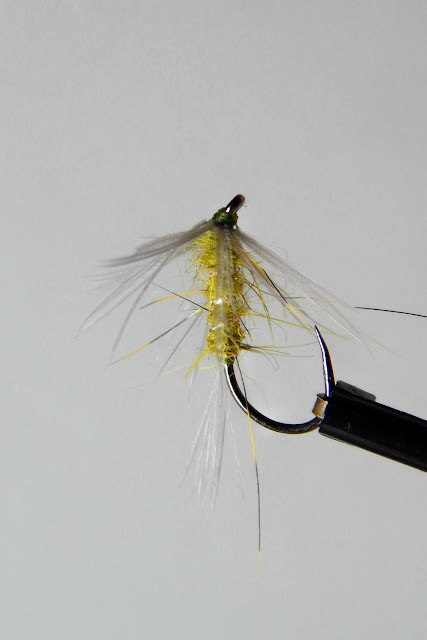 A very cold weekend gave me the opportunity to tie some real old North Country patterns. The patterns were from the book The North Country Fly, Yorkshire"s Soft Hackle Tradition, by Robert L. Smith. The recipes were from lists that were made at the time the flies were tied and fished. Some listed when the fly would be most effective, as well as other interesting comments. The flies are tied true to pattern for the most part exceptions being some of the game bird feathers are not available or no longer legal to obtain. North Country flies are a joy to tie and doing so I got the feeling of casting them upon the fabled waters of the North Country. Back in 2005 TU published an article in their magazine TROUT about a little stream in southeast Massachusetts called Red Brook. The stream flowed through property owned by the Lyman family to it's meeting with the salt water bay known as Buttermilk. In this brook lived the remnants of a once thriving robust breed of trout called "salters". These brook trout were special, spending part of their lives in salt water and part in fresh. The salters attained some serious size and were the quest of some notable anglers. But it seemed to be to good, and like many fisheries of past it took a turn, and not a good turn. 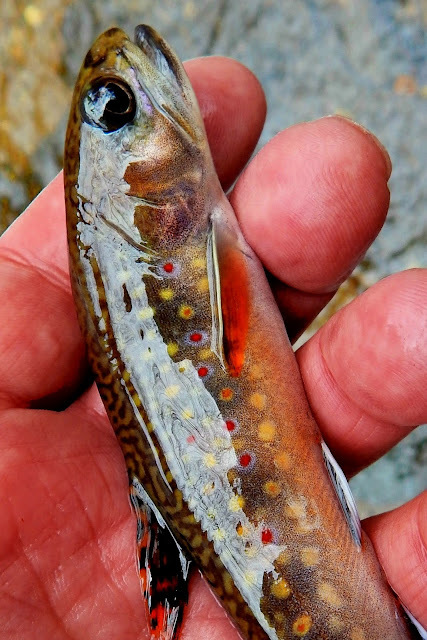 The dams of early days, to much agriculture, and just poor management proved to much for the brook trout of Red Brook. That's when a man named Warren Winders and a group of dedicated anglers, as well as many environmental groups took action and they reversed the bad effects on the salter. Jeanette and I first visited Red Brook in 2008. That day I can remember seeing a stream that was already under a restoration. A stream that still had wild brook trout, a stream that was in an area that my words could do it justice. This is a stream where you could leave your fly rod in the car and spends hours and not even miss it. The smells of pine and wildflowers, the calls and screeches of many birds, and the red stained waters flowing through watercress would provide words for your journal. Since that day back in 2008 we have visited the special place many times. Each year spring and fall will find me casting to brook trout. These days I'm glad I've been graced to know Red Brook. Days here few people are about. From time to time we have witnessed a few trail walkers, and some anglers, most of those are anglers who seek larger fish that Cape Cod has to offer. The research and restoration effort continues today. Mass Fish and Wildlife, TU, Mass Maritime and more groups along with countless hours of volunteer labor have really paid off. In September of 2015 Jeanette and I fished Red Brook. That day we were introduced to a group that included Steve Hurley, MF&W, Geoffrey Day, of the Sea-run Brook Trout Coalition and a couple of wonderful interns from Patagonia Boston....and Warren Winders. It was a pleasure and honor to finally shake hands with this tireless fighter for the welfare of the brook trout of Red Brook. What can you say to a man that has done so much....two words...THANK YOU..from the heart. We had some snow yesterday morning, a common occurrence lately but I was going fishing and that was not a bother. It was late morning when I left, the drive to the stream was not bad. The real issue came when I arrived. The town had done an outstanding job on clearing the roads, but they did not clear any roadside turn-offs. A 4 wheel drive would have no problem but a little Honda just would not cut it. I drove around until I found a spot where I could park, and that was a half mile hilly walk. I grabbed my gear and was off to Hemlock Creek. Another tributary to the river above. I fished it once and don't think I caught anything. Walking to where the trail starts and Hemlock Creek was right where I had left it in sunnier days. I found some receptive brook trout in the pools. They were not tentative, and took the fly with authority, several fish dancing in the air. No one here but the snow, the stream and me. Winter angling can be so peaceful. An outstanding specimen of a very healthy stream. When you focus on this brook trout you can see why I call them jewels. No prints here but mine. And another accomplishment this day was that I never slipped on the snow or into the water. A few days after "Phil" said we were to have an early Spring it seems that Winter took offense and hit us with snow, and looking out my window it's snowing again. Although the snow may put a hold on the fishing it's sure to put some water into the coffers for later use. Last Thursday two days after groundhog day I took the opportunity to get out and fish. The weather was so beautiful I thought it was April. The forest was barren of snow and the stream was as good as it gets. This stream is never really "ripping" and I knew that the brook trout would have no fear and would be looking for food. I always fish the lower end of this stream, mainly because the access is so welcoming. But this day I chose to work the upper reaches and see what it was like. Aside from the laurel thickets it was not to bad. I was wearing hiking boots so access to some of the pools was a challenge. The brookies seemed to be holding right at the base of the stones in the plunges. Your fly would be swept under and sometimes when you pulled it up there was a brookie on it. A gorgeous brook trout. This fish had such an awesome rust color to it, and that tail was so beautiful. I'm going to have a print made of it and put it on my tying desk. I walked further upstream, each pool and run looked more inviting than the last. Most of the brookies caught today were as this one. This little hen shall be part of next years egg layers...my goodness what beautiful offspring! I did not make the top of this stream, perhaps next time out in "Brook Trout Forest"